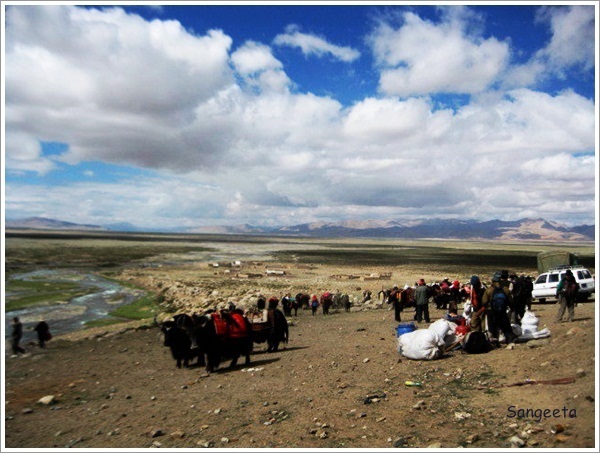 The first part of the Kailash Parikrama journey is At the feet of the Mystic Mountain (Part 1). Sometime at midnight, the much anticipated restful sleep in Deraphuk turned out to be otherwise. I had an attack of mountain sickness with severe nausea and I had to rush out of bed to the courtyard multiple times in the biting cold. I was overcome with fear whether my physical body and fate would co-operate for the rest of the journey. With tears in my eyes, praying to the almighty to make me fit by morning, I tried my best to drift into sleep. The thoughts of Kailash Parikrama kept bubbling as I tossed and turned in bed. Next morning in Deraphuk, I was weak but determined. One look at the glistening snow capped Mount Kailash under the slanting rays of the sun, my inner voice assured me I will be able to complete the journey. Many people go back to the base from this point, sometimes their health gives up and often weather gods play truant. I politely declined all requests to take a pony for the rest of the journey and went ahead on foot with my helper. To me, it did not feel right to ride on an innocent animal. I knew, I was divinely purged the previous night to make space for the cosmic shower that would fill me in during the day. 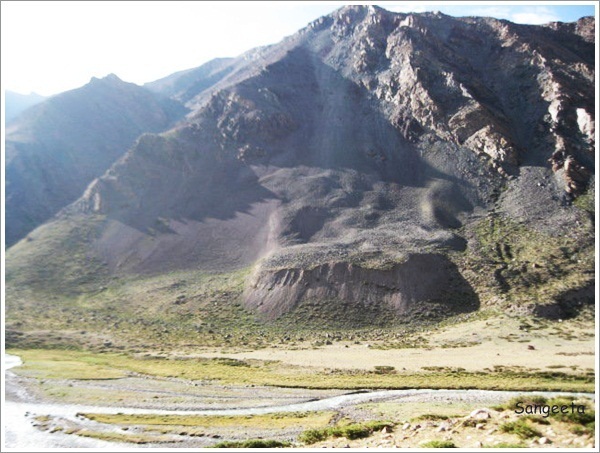 The 22 km trek to Zutulphuk was arduous, with a steep upclimb to Dolmala Pass (nearly 5600 mts) via Digbala Pass and then a steep decline into a green valley. I started off at a brisk pace, keeping pace with the rest of the group. Within an hour, I felt a stinging pain on the right side of my back, a strained muscle which slowed me down. Not to be cowered, I swiftly and generously sprayed Pain Aid on my back and moved ahead. The message was clear, it was time to slow down and focus on the journey as the destination and not vice-versa. I stopped often, looking around in gratitude for the accumulated blessings from many lifetimes that were coming into play. After about 2 hours, I reached Digbala Pass also known as Shivasthal at a height of 5320 mts. The entire place was strewn with used clothing left behind by people as a mark of seeking detachment from material possessions. While I am convinced about the detachment bit, I am not quite in agreement with throwing around clothes and plastics and bottles and suffocating the mountains. Further upclimb for the next 2 hours to Dolmala Pass (5610mts) was a lesson in mindfulness, negotiating rocks, prayer stones left behind by pilgrims, patches of snow, yaks and ponies. Finally, when I made it to Dolmala Pass or Dromala Pass, the holiest spot in the route where devout Tibetans leave behind a lock of hair or a drop of blood! !, I was unable to linger around for the fear of getting breathless at that height. There was just enough time for one quick prostration and a couple of quick clicks for posterity. The prayer flags were swaying with the wind carrying the hopes and gratitude of the people who passed by. You might just find mine there when you go next among the numerous nameless ones bearing hope and gratitude for a life fulfilled. The path down into the valley was steep and quite hard on the knees. My back pain seems to have quietly subdued under my steely determination. 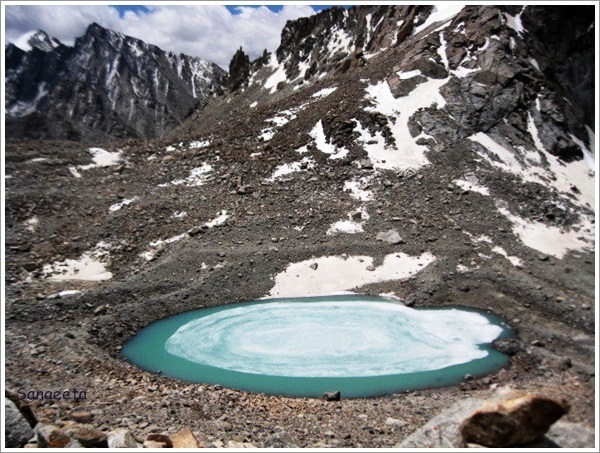 Within minutes, I could see a beautiful patch of blue-green deep down in the valley which is known as Gouri Kund the nearly frozen lake surrounded by huge stones. Legend has it that Devi Parvati was taking a bath here with her son Ganesha standing guard when his head was accidentally chopped off by Lord Shiva who then got the elephant head for him as a mark of penance. Rinjee my Sherpa, adept at climbing mountains, went down in minutes and filled a small bottle with that heavenly honey from the lake. After a 3 hour descent I was in the soothing green valley. Apparently, it is in full bloom just after monsoon in the month of August. The cold sandwich and even colder water tasted heavenly after a nearly 7.5 hour walk. The remaining 3 hour walk through the valley to Zutulphuk was through undulating patches of green and stones of all sizes except for one steep section. The valley was reverberating with chants of Namah Shiva, Om Mane Padme Hum and the haunting Tibetan folk tune “O ho O Hoi ya”…..(next line is whispered silently under the breath as it refers to Dalai Lama being the SUN of the land). I was chanting and singing along too when the words of Robert Frost flashed by. “I have miles to go before I sleep”, I dont want to sleep, but spend as long as possible in the lap of nature, in this magical, mythical, mystical valley, absorbing cosmic energy. I was trying to gather prayer stones when it began to drizzle, the almighty was also in agreement. I was lucky to have experienced all 4 seasons in a single day. Whenever, I thought of the universal almighty during the journey, I was led from the front, by a black dog, wagging his tail happily. I was almost there when I saw one of the Sherpas waiting at a bend with a flask of hot energy drink. I had walked nearly 11 hours and all I could do was nod in gratitude. In the last stretch, I was overwhelmed to see a few ladies belonging to the Bon Po tradition circumambulate through prostration which takes them nearly 3 days. I was happy to sight the Zutulphuk Monastery where we were to spend the night. The yak welcomed me along with my pilgrim group who had reached much earlier. The yak welcomed me along with my pilgrim group who had reached much earlier.There was no fatigue, no pain, I was blessed to spend the time in solitude, in oneness with nature for 11 hours. Life’s priceless blessings!! That night, I slept like a child, I was born again !! Shiva had granted me my chilhood wish, it was time for me to act. Next morning, the sun was bright as ever and the 3 km stretch along the river was easy on the body. At the ending point, close to where we started our journey 2 days ago in Tarboche, it was bustling with activity, faces covered with layers of dust greeting and hugging each other in happiness for they had spent their time at the feet of the mystic mountain and completed Kailash Parikrama. I looked up and silently thanked the master for the blessing I was showered with. Why do I feel that I have a deep connection, a past life, a divine chord, natures attraction that brought me here, At the end, I dont think I quite understood what it is and somethings are better left that way. But, I will come back again to trace my footsteps in the divine valley. I would like to thank Jyoti Adhikari of Ecotrek International in Kathmandu for organizing a wonderful trip and all the unsung heroes who served us food, carried our bags, drove us and greeted us every morning with a quiet and unassuming smile. Thanks Shweta. This is a huge compliment. The biggest joy for any travelogue writer is to be able to take the reader along on the journey. Bless you for this journey to Shiva’s abode. Wonderful post Sangeeta. I enjoy reading your posts. Thanks much for sharing. I have added this to my bucket list too. Divine indeed. I’m can see it was an amazing experience. Gouri Kund looks heavenly. What a gorgeous colour!! Thank You. I often want to go back to Mount Kailash. My small camera hardly did justice to the beauty of Gouri Kund and I cannot reproduce what my eyes have seen…. That is my dream destination! It was for me too. Hope your dreams are realised soon. Very well written. May be you can start a travel blog or contribute to India Today Travel Magazine or some thing similar. Many more people will be benefited. Thanks a tonne. Thats a huge compliment. Most of these trips have been done in the past and I am putting my mental notes on paper. I would love to write and reach out to people, since travel is my passion. Lets see when the opportunity dawns. Beautiful photos! I particularly love the yak – best animals ever. Very well articulated and captured. Just added this to my bucket list. Thanks for sharing! Thank You. I recommend it to everyone, may your desire be fulfilled shortly.